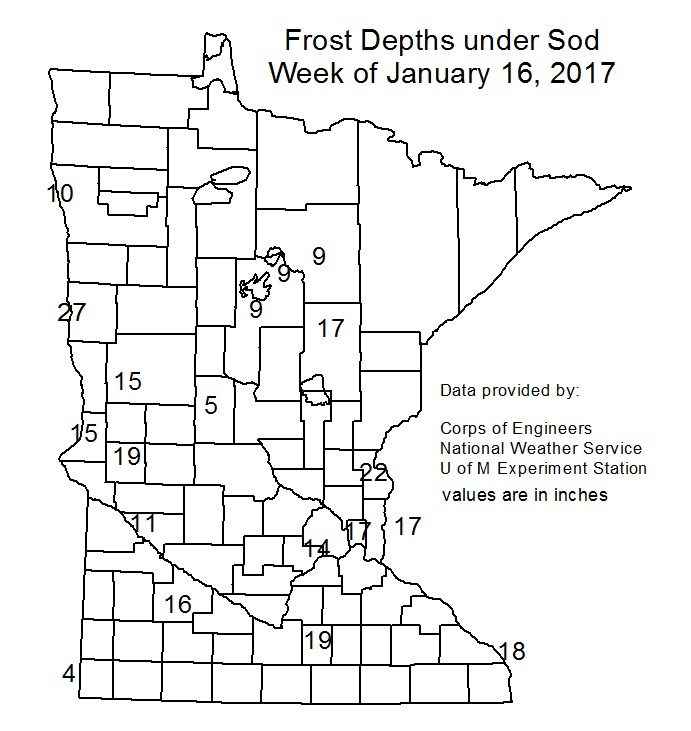 Frost depth varies across the state in January 2017, but is generally shallower for the time of year. The map on the right depicts the depth that the ground is frozen under sod across the state. The frost depth is measured by a simple instrument called a frost tube. The liquid freezes in the tube as the ground becomes colder. Frost tubes were installed by the National Weather Service and the US Army Corps of Engineers (USACOE) at various places around the region. Frost depth readings are updated by the USACOE on a weekly basis. Also, the Chanhassen National Weather Service has frost depth information at the bottom of this table. Snow can insulate the ground from the air above it and studies have shown that about four inches of fluffy snow will form an effective layer of insulation. When there is a deep snow pack, there can be little to no frost in the ground. Where the landscape is free of snow, the frost can penetrate much deeper. Below is a history of Frost Depth Information from a volunteer site in Maplewood, MN just north of St. Paul.